Elvira, Mistress of the Dark has been The Queen of Halloween for decades. But do you have all of the scoop on the vampirish cult character and her alter ego– actress and brilliant business woman Cassandra Peterson? Below are 13 fascinating facts to get you up to speed on all things Elvira. 1. She is a Halloween regular at Knotts Scary Farm, where she stars in her own live stage show. 2. On Sunday, October 25th, Elvira will be a special guest judge on the Food Network’s Halloween Wars (9pm ET/PT). 3. Her favorite Halloween candy is candy corn. 4. Cassandra Peterson helped design her own Elvira costume in 1981, when she was hired to host a local B-rated horror movie television show. 5. Cassandra Peterson was absolutely shocked when Elvira became a national sensation. “[Initially] It was one of those jobs I didn’t know if it was going to last more than a week. I was very skeptical,” says Peterson. 6. Creating amazing costumes is in Peterson’s genes. While she was growing up, her mother and aunt owned a costume store where she would work during the busy Halloween season. 7. Her favorite scary movie is her own funny flick Elvira, Mistress of the Dark! which Peterson calls a “Halloween classic”. 8. Fear the Walking Dead is her favorite, current, scary show. 9. The Addams Family and Bewitched remain her retro, Halloween-inspired television favorites. 10. Cassandra Peterson is the owner of Queen B Productions where she oversees the Elvira brand and merchandises Elvira products. 11. 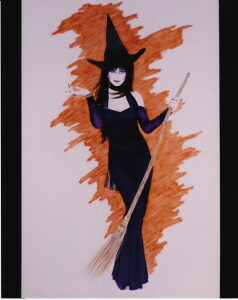 Elvira has made appearances on everything from the Grammys to NBC Football. She has appeared on The Tonight Show seven times. 12. Cassandra Peterson was a member of the improv group The Groundlings. 13. Cassandra Peterson appeared in Pee-wee’s Big Adventure starring fellow Groundlings’ alum Paul Reubens. Listen to a Halloween Classic podcast with Elvira’s Cassandra Peterson here or on iTunes. Shockingly, I already knew all these facts. I love Elvira so much, I’ve been a fan since I was 10 in the 5th grade. Hopefully I can meet the queen of Halloween someday!! I met her once and got an autograph picture. It was as route 66 in San Bernardino. She was very nice and very petite! Thanks! !a big fan of Elvira!! I was hoping to find out if her rack is real or fake. Yes, it is real. There are numerous articles that explain in more detail. She also uses contouring makeup to enhance her assets. She’s one of the awesomest people to have ever lived. Thanks Donna! You two would be BFFs. I’m not kidding. Both kind and fun AND great business women. Thanks! I love Elvira. Always was a huge fan and it’s fun to know someone who got to know her! I live vicariously through you!